Each and every sculpture we do requires an armature. 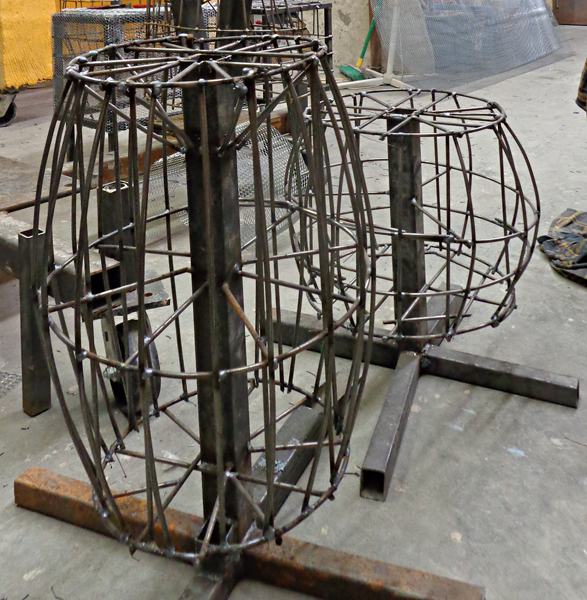 We weld it in two parts, one being a structural frame and the other being the pencil rod. Its 1/4" round mild steel that is easily shaped (by hand) and then welded into place. We have now topped 20 miles of steel in this project (so far). Today some small features were welded up, freight for around the horse drawn wagon. There are two boxes which will double as steps up into the seat of the wagon (for our small guests) and these two barrels. The bottom square tubing act as a stand while we do the sculpting and then will be set into the concrete anchoring them in place for ever. It is a lot of fun to imagine the ideas, fashion the frames and then do the final sculpting and painting to realize our vision. Each day the list of things yet to do gets a teeny bit shorter but the end deadline is rushing towards us in a hurry.